Sorry these3 were held up so long—I have been away on a long motor trip4. Please than Miss Sims5[?] for the interesting letter she sent me. Please mail me a copy of Gertrude Hall’s6 “Wagnerian Romances”7 as quickly as you can. I will be back in New York8 late in February, will let you know the exact date later. 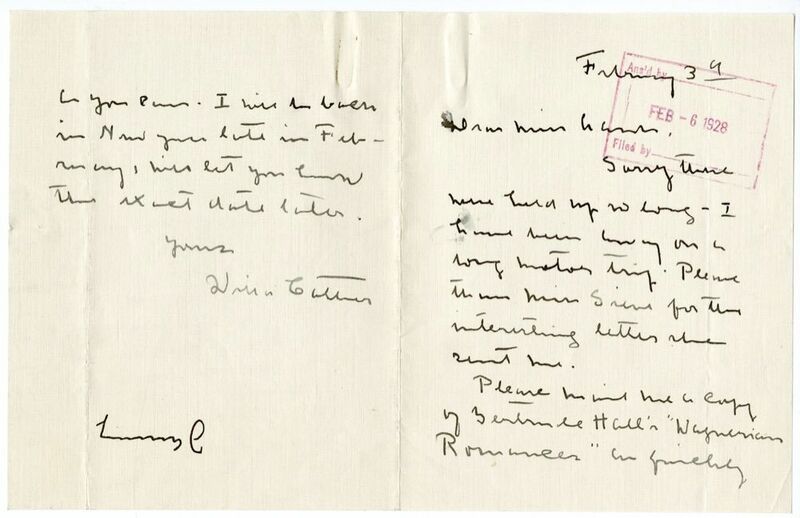 On 20 January 1928, Aaron mailed Cather clippings of British reviews of Death Comes for the Archbishop (1927), asking her to return them after she read them. Cather had traveled to Red Cloud, NE, in early December to visit her family. From there she went by car to Arizona (see #0924). Brownell, Gertrude Hall (1863-1961) (“Kitty”). American writer and translator. Born in Boston, MA, Gertrude Hall published poetry and short fiction in the 1890s, and translated Edmond Rostand’s Cyrano de Bergerac (1898); later she translate Rostand’s Chantecler (1910) and Paul Verlaine’s poetry. She married critic William Crary Brownell in 1921. Cather first encountered Hall’s Wagnerian Romances, which retold the stories of Wagner’s opera, while in the Southwest, and, as Cather wrote in an introduction to Knopf’s 1925 edition of the book, it influenced the account of Thea Kronborg’s career in The Song of the Lark (1915). Cather appears to have known the Brownells socially in New York City.